-AZUL- « My name is Ananya Mai..
Head: #TheMeshProject (BETA) Head(f) – Fierce (Deluxe) @The Mesh Project. The Search for Miss AZUL 2015 accepts entries from 1 March 2015! The Search for Miss AZUL 2015 begins! 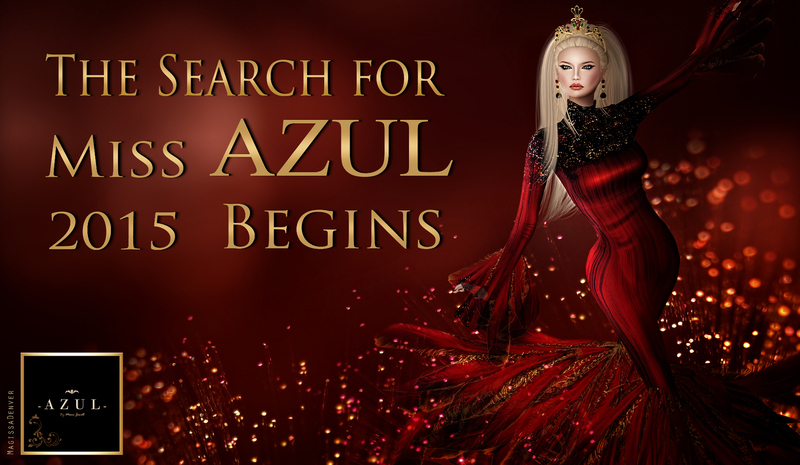 Miss AZUL 2015 represents a career defining opportunity to become one of the most highly respected, recognised & sought after avatars in SL Fashion. You, the selected candidate will become the face and representative of a RL Japanese business based within the Virtual World of Second Life. You will represent a Trans-Pacific Japanese Fashion House based in the SL fashion industry which is unparalleled in its Popularity and Longevity with exposure to an established INWORLD GROUP of approximately 24,000 members and business ESTABLISHED 8 years ago in 2007. -AZUL- has been associated with & launched the career of the vast majority of the most highly regarded & established avatars in SL. It is one the few brands to make the crossover from a Japanese to Western audience and which to this day maintains its position as fashion forward brand leading the way in creativity at the forefront of SL Fashion. 3. Receive a custom Tiara made by Virtual Impressions. 4. Have a beautiful dress named after her. 5. Be promoted through -AZUL- inworld groups which contains approximately 24,000 members. 6. Receive all -AZUL- new releases during her reign. 1. If any un forseen circumstances arise due to Miss AZUL 2015 being unable to fulfil her role, then the first runner up will fill this position and will reign as Miss AZUL 2015 for the remainder of the contract. – For the duration of the Miss AZUL contest, please include a pick to the -AZUL- mainstore in your profile. We also encourage and invite you to join our -azul- inworld group as we will be sending out information on Miss AZUL 2015 through this group and you also get notification of incredible group gifts. 1. Please submit two (2) photos of yourself wearing -AZUL- at a minimum size 512×512 (one headshot and one full length) to the Miss AZUL 2015 Flickr Group https://www.flickr.com/groups/missazul2015/. Please name the picture “Miss AZUL March 2015 submission – Your full SL name”. In the description, please include the name of the -AZUL- outfit you are wearing. 3. Fifteen (15) applicants will be selected from the entries and they will be will be required to walk at a live casting show Sunday 19 April 2015 1pm slt. Please note that only entries submitted from 1 – 10 March 2015 will be reviewed. 4. There will be one rehersal for this show Saturday 18 April 2015 2pm slt. -AZUL- by Mami Jewell reserves the right to remove any photos that do not comply with the above requirements. 1. Another round open for photo entries. Please submit two (2) photos of yourself wearing -AZUL- at a minimum size 512×512 (one headshot and one full length) to the Miss AZUL 2015 Flickr Group . Please name the picture “Miss AZUL May 2015 submission – Your full SL name”. In the description, please include the name of the -AZUL- outfit you are wearing. 3. Fifteen (15) applicants will be selected from the entries and they will be will be required to walk at a live casting show Sunday 21 June 1pm slt. Please note that only entries submitted from 1 May to 10 May 2015 will be reviewed. 4. There will be one rehersal for this show Saturday 20 June 2015 2pm slt. Twelve (12) Finalists have ONE (1) month to prepare – quest will be given at that time. *Finale Walk – September 27 Sun 1pmslt. After the finale walk, the points gained throughout the contest will be added up and Miss AZUL 2015 will be announced. If you have any questions regarding Miss AZUL 2015 please contact Ananya Mai. You agree by submitting an application, that -AZUL- by Mami Jewell inclusive of all social & visual media groups on the internet & groups within Second Life of which -AZUL- by Mami Jewell owns or is a member of is permitted to use all submitted pictures throughout the competition in any way the company considers appropriate. I have been meanting to blog this outfit for a while now! Jewelry: !dM deviousMind “MataHari” ChestLace w/ Chains (BOX #3) – RARE (!dM MataHari – ChestLace add-on **FLOWER** (rightPec) and !dM MataHari – ChestLace w/ ChainsEpaulettes **GOLD** (leftPec) Creator Chandra Meehan. Now I got this @ The Secret Affair Event however it was in January 2015 so it may not be there anymore. Check the mainstore if it is not at the Secret Affair event. Headpiece: !dM deviousMind “MataHari” HeadDress **TRIBAL** (BOX #1) – RARE Creator Chandra Meehan. See above note about where to buy. Skin: THESKINSHOP (09) (SKIN) ‘Deja’ (Fit) @The Mesh Project.
. come over and allow me to love you. The first two photos were taken by the gorgeous Serena Novo. I am trying to convince her to start blogging. I love her photos! Jewelry: [The Forge] Rosana Headpiece (Gold/Silver) Creator Deccan (deccan.arida) @ Secret Affair. 1. If any unforeseen circumstances arise due to Miss AZUL 2015 being unable to fulfill her role, then the first runner up will fill this position and will reign as Miss AZUL 2015 for the remainder of the contract. 2. 15 applicants will be selected from the entries and they will be will be required to walk at a live show Sunday 29 March 2015 1pmslt. 3. There will be one rehearsal for this show Saturday 28 March 2015 2pmslt. 2. 15 applicants will be selected from the entries and they will be will be required to walk at a live show Sunday 21 June 1pmslt. 3. There will be one rehearsal for this show Saturday 20 June 2015 2pmslt. 12 Finalists have 1 MONTH to prepare – quest will be given at that time. Finale Walk – September 27 Sun 1pmslt. You agree by submitting an application, that AZUL by Mami Jewell inclusive of all social & visual media groups on the internet & groups within Second Life of which AZUL by Mami Jewell owns or is a member of is permitted to use all submitted pictures throughout the competition in any way the company considers appropriate.